With the weather turning warmer, sometimes the thought of a big serving of protein as a main course -- a piece of chicken or a steak, for instance -- can sound heavy in this season, even if simply grilled. My go-to secondo on balmy Roman nights was always, and remains, one of the most beloved but least-discussed dishes in the Roman culinary canon: straccetti. These are torn, as the word means in English, thinly-sliced pieces of beef made to look like rags (straccci). But the slightly disparaging-sounding name belies the deliciousness of this dish. 2 pounds beef sliced extra-thin (ribeye or chuck work well) -- ask your butcher to slice on a meat slicer if possible, or slice thin, pound flat, and slice again into little torn "rags"
- In a large sauté pan, heat a few spoonfuls of olive oil over medium-high heat. Add a garlic clove and let it cook for 20-30 seconds. - Add just enough of the the thinly-sliced beef to fit in the pan without being crowded, and cook, moving the beef around the pan so it doesn't stick, until the redness has turned to brown and the beef is cooked through. Season with salt and pepper, and transfer to a bowl. - Continue with the remaining beef in this way, until all of the beef has been cooked through and seasoned. - Return the beef to the pan over medium-high heat, and when it starts sizzling, add the wine, cooking to evaporate the alcohol, for about a minute. Add the balsamic, and let that cook for about 3 minutes more. Taste and season appropriately. - Throw in the butter and allow it to melt into the sauce. Taste again and adjust the seasoning. 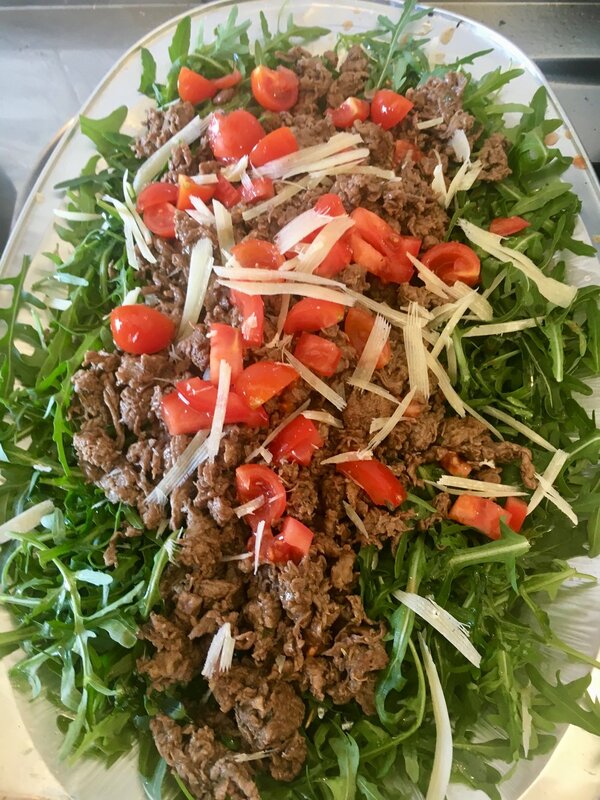 - On a plate or platter, arrange the baby arugula, then place the beef on top of the arugula, using tongs. Top with the tomatoes. - Spoon the pan sauce over the dish, then top with the parmigiano shavings and a drizzle of olive oil. * Serve with bread to properly fare una scarpetta (mop the sauce with the bread) afterwards. Since the response to the photo I posted on social media elicited quite a few oohs and ahhs, I promised some people I'd post the recipe in my blog's "Recipe By Request" section. But first, of course, I had to write the recipe. For this particular recipe, we're talking the classic Italian IN GUAZZETTO preparation, which basically means it's something slowly stewed in what it usually olive oil, white wine, a little broth, and often cherry tomato, onion, and garlic. It's a standard, particularly in southern Italy, where it's most commonly made with seafood or fish of some kind. This version is a bit fancier than your average in guazzetto, but fully in the tradition of using local ingredients and flavors of the southern half of the Italian peninsula. The stew is often served in some kind of shallow stew pot, cast-iron mini skillet, or some such stove-to-table vessel. It's a rustic presentation that I love. Squid -- calamari, in Italian -- can be a tricky creature to cook, though I adore making it and eating it, for its versatility and briny, tender deliciousness...when it's done right, that is. Who hasn't endured a rubbery squid situation, which becomes an over-mastication situation, which is elevated to a sore jaw and where-can-I-spit-this-out dilemma? Don't let it reach an I-refuse-to-cook-calamari-conundrum! Following a few easy steps will provide you with a painless calamari cooking experience. The basic theory is this: squid is a protein which benefits from either a very quick, 2-3 minute toss in the pan (or deep fryer), or a longer, lower-temp stew on the stove. It's about hitting that sweet spot -- or rather, about avoiding the peak of the hill. What do I mean? Fammi spiegare (let me explain). Basically all proteins all have a little cooking hill, as it were. A short cooking time will allow them to cook either to rare, or medium rare (in the case of a more dense protein like a steak or a chop), or juuuust enough to be perfectly tender and cooked through to be edible, as in the case with shrimp, scallops, calamari, etc. The longer you cook them, the higher up that hill you climb. When you reach the top of the hill is when the protein has reached its most firm, fully-cooked point -- which is when you DON'T want to eat it. Think a well-done steak, or shrimp that's been cooked to the point of being rolled up little balls of iodine-laden beach pebbles. Non bene! What we want is the sweet spot on almost-flat ground, as it were. So, you either sear the steak and enjoy it medium-rare, or throw it in a stew for 3 hours and enjoy the falling-apart tenderness that is a good boeuf daube. Similarly, calamari is either flash-fried or -sauteed, or stewed for longer, though the longer cooking time for squid is far shorter than for a beef stew. It's more like 3 minutes on the short end or 30 minutes-plus on the long end. Still, time flies when you're stewing calamari! (Okay no one says that, but we could try to make it a thing). As you will learn from doing, the slow braise is totally worth it and really a cinch once you get the hang of it. The recipe that follows is proof positive of that. (*'nduja sausage can be hard to find, though it's DEFINITELY worth seeking out. A decent substitute would be andouille sausage, whipped in a food processor with some olive oil to soften -- or even a soft Mexican chorizo could fill in here. Otherwise, make your own mixture of smoked bacon or pork belly, lots of chili flakes, and olive oil or lard pulsed in a food processor). - Heat a cast iron or heavy-bottomed skillet on medium-high until when you hold your hand over it, you can feel a good bit of heat. Pour in enough of the olive oil to coat the bottom of the skillet. - Throw in the celery and onion and let that cook for 2-3 minutes until it begins to soften. Add the sliced garlic. Turn the heat down to medium. - Toss in the calamari and 1/2 of the cherry tomatoes, 'nduja, and capers + brine, and stir to mix the flavors up a bit. Cover and cook on medium-low for 5 minutes. - Remove the cover and pour in the white wine. Let this cook, cover off, for another 5 minutes until the alcohol burns off but you still have plenty of liquid. - Sprinkle in some salt and pepper to taste and cover the calamari and continue cooking on medium-low for another 10 minutes. - Remove the cover, toss in the second half of the cherry tomatoes, a bit more olive oil, and cover again to cook for another 10 minutes or so (if the calamari is a little dry here, you can add the fish stock, or even water, at this point). - Test for doneness of the calamari. If it's not tender enough, keep cooking over low heat, covered, until it is. - When calamari is tender, remove the cover and add the lemon juice and half of the chopped parsley. Taste and adjust salt and pepper as needed. - Finish with a drizzle of olive oil and the rest of the freshly chopped parsley, and serve directly from the cooking skillet/vessel, with plenty of crusty bread to sop up the delicious sauce! There are few things better on a bitter cold day, or evening, than a bowl of ribollita, the cool weather Tuscan bread soup. It's made with a Tuscan minestrone base, to which stale bread is added -- preferably the tasteless, salt-free crusty bread that became a staple in Tuscany when an overwhelming majority of citizens refused to pay a steep salt tax. It's even been used to clean precious frescoes in Tuscan churches, as its texture is similar to a sponge (its stand-alone taste is fairly similar, too). How is a Tuscan minestrone different from your average minestrone, you may ask? It shares all of the basic vegetables, like celery, carrots, and onions, of course. But Tuscans, like their mangiafagioli (bean-eaters) moniker suggests, often add cannellini beans to dishes, for added heft, starch, and protein. Their minestrone is no exception, so they use beans to replace the tiny pasta tubes that the rest of the Italian peninsula uses. They also add Tuscan kale (or lacinato), what in Italian is called cavolo nero (black kale) or cavolo laciniato (fringed kale). This is sliced or hand-torn into strips that get thrown into the minestrone, adding color and great nutrients and fiber to the soup. The thing that turns Tuscan minestrone into ribollita (which literally means "re-boiled") is the addition of bread. The Tuscans are a thrifty bunch, not ones to let bread go to waste simply because it's stale. So they have a series of bread-thickened soups in their culinary repertoire to make the most of it. Ribollita is the wintry version, and it's one of my all-time favorites. It freezes well, so you can make a huge pot of it during, say, a February snowstorm. You can eat it until (and if) you get sick of it, and freeze the rest for another blustery night. - Warm 6 TBS. of olive oil in a large pot over medium heat. When it's hot, toss in the onion, celery, carrot, and garlic. Sprinkle with a dash of salt and pepper and cook, stirring so the vegetables don't stick, until they're softened, about 5 minutes. - Add the tomatoes and beans, stir and cook for 2 minutes. Add the broth and the rosemary and thyme, and cook for 15-20 minutes, so the flavors meld. - Add the kale (and remove the herbs if you'd like), and stir to blend. Add salt and pepper to taste. - Tearing the bread with your hands into bite-sized chunks, slowly add the bread to the broth, mixing to absorb the bread every 10 pieces or so. You may not use the whole loaf, but you may. The consistency should be a thick porridge. Let the soup cook another 15 minutes or so, simmering on low, so the bread breaks down and becomes integrated into the soup a bit. Taste to adjust for seasoning. - To serve, ladle into bowls, drizzle generously with the highest-quality extra-virgin olive oil you can find (Tuscan is most relevant here), and sprinkle with grated parmigiano cheese. Note: Like most soups, this one is even better the next day, or even the day after that. Since it's ribollita (re-boiled) anyway, it keeps very well for several days in the fridge, or for 2 months in the freezer.